Royals pitcher Jeremy Guthrie is Monday's Player of the Day. Guthrie pitched a complete-game, four-hit shutout, striking out seven, in the 13-0 win over the Twins. Giants pitcher Chad Gaudin is National League Player of the Day. Gaudin struck out eight and gave up one run over 6 1/3 innings (but earned no decision) in the 4-2 win over the Brewers. Alex Rios of the White Sox is American League Batter of the Day. Rios drove in four runs and went 2-for-4 in the 8-1 win over the Yankees. Notable: Tigers pitcher Anibal Sanchez became the 25th player this season to earn 10.0 or more Box-Toppers for the season. 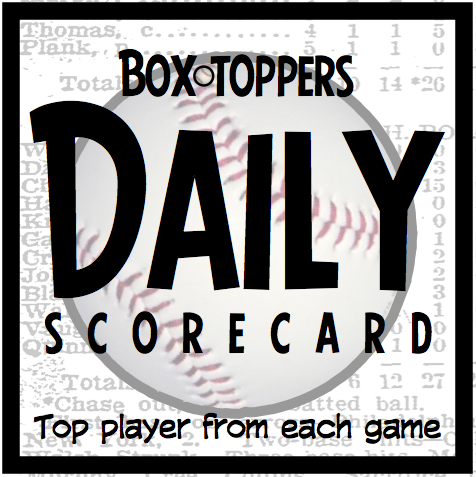 Sanchez (7.2 IP 11K ND in the 4-2 win vs. the Indians) earned 1.0 Box-Toppers point for being Player of the Game, giving him 10.0 for the season, putting him in 25th place in Box-Toppers points among players this season. Guthrie receives 2.0 Box-Toppers points for being Player of the Day. Gaudin receives 1.7 for NL Player of the Day. Rios receives 1.5 for being AL Batter of the Day.